The Brill Razorcut push reel lawn mower is the newest push reel mower model from Brill, and it's our favorite. This precision designed machine is, in our opinion, the Mercedes of reel lawnmowers. 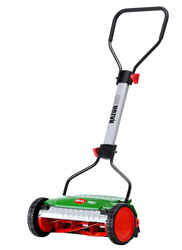 It has the same great features of past Brill push mowers, with a sleeker new look and an improved, stiffer handle. You don't have to struggle with a hard-to-start, noisy, polluting gasoline powered mower. 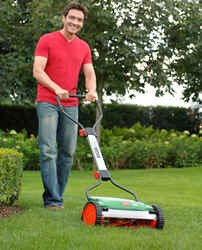 With a manual reel lawnmower, you just push and it mows! It's so quiet that you can carry your phone while you're mowing and actually hear it ring. No engine trouble, no running out of gas, no disturbing your neighbors with noise. 5 Blades -- The optimal number of blades for superior cutting and ease of pushing. Silent cut design -- The blade misses the bedknife by less than a millimeter. This reduces friction and allows the mower to cut the grass like scissors. It also increases the blade life, which means you won't have to sharpen for a decade or more. Flame hardened, welded steel blades -- harder than tempered alloy, which also helps increase blade life. Dry powder coat on metal components -- Powder coated surfaces are more resistant to chipping, scratching, fading, and wearing than other finishes. And colors stay bright and vibrant longer. Powder coating is also highly protective of the environment, because it contains no solvents. Sealed bearings. No extra maintenance required, because the bearings are sealed. Brill mowers feature a 2 year manufacturer's warranty. Mower comes fully assembled except for the handle. 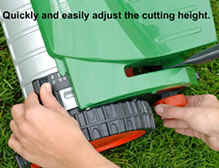 The handle comes in three pieces and requires no tools to put together and attach to the mower. Takes about 10 minutes to get out of the box and into the yard. The handle has a great design giving this model a more stylish and sleek look while allowing for easy maneuvering. length cut for a wide variety of grass types. Brill mowers are lightweight, which makes them perfect for most types of grass. have St Augustine grass, Zoysia, or Bermuda. Brill reel mowers have a sealed bearing with a separate bearing race.